It's morning here, anyway. 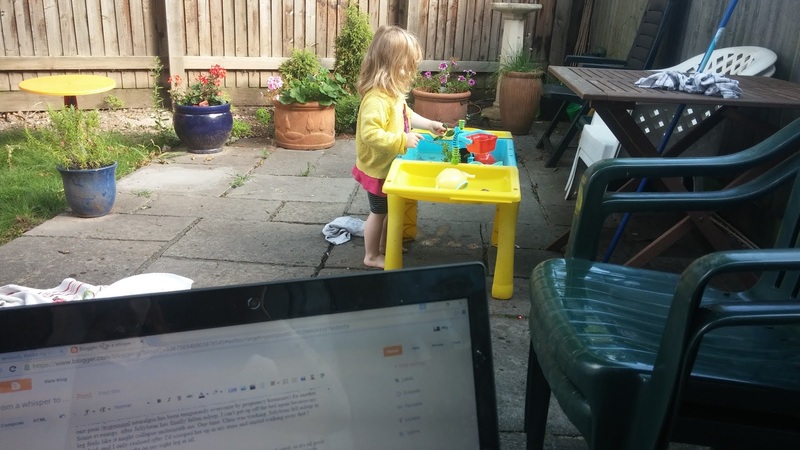 The washing machine is on, my child is somewhat fed (we had a tantrum incident involving the correct way to cut up a crumpet), and now I have ten minutes of me time while she plays in the garden. I haven't blogged in ages. The truth is, I haven't felt like it. Every now and then I just want to give myself some space from it. Because if I'm not enjoying it, what's the point? Besides, looking back on old blog posts, I can tell which ones I've loved writing and felt passionate about and which ones I wrote out of duty because I need to fulfil my 2 x a week posting schedule. I've gone on a kind of summer wind-down. Which sounds nice, but actually, it's more about survival. We've all been ill, on and off, for the past couple of weeks, a weird summer cold that we think has gone but then suddenly reappears unexpectedly. It makes my head feel all thick and fuzzy, like trying to think through fog. Also, my husband has been working mostly 6 day weeks for the past couple of months, during which time my pelvic joint pain has come back with a vengeance. I completely forgot how bad it is. In fact, this time, it's been a bit worse. With Jellybean, it hurt, but I still managed to work 40 hours a week mostly on my feet all day (thanks to my lovely former colleagues for helping me out back then), looking after hoards of small children. Now, I walk to the park and back, and that can be enough to leave me unable to get around properly for the rest of the day. I've been quite frustrated by it because I feel totally useless, and also because I've essentially swapped one pain (trigeminal neuralgia has been temporarily overcome by pregnancy hormones) for another. Some evenings, after Jellybean has finally fallen asleep, I can't get up off the bed again because my leg feels like it might collapse underneath me. One time, Chris was working, Jellybean fell asleep in our bed, and I only realised after I'd scooped her up in my arms and started walking away that I couldn't put any weight on my right leg at all. But the good news is the baby is super healthy, wriggly, and my bump is normal sized, so it's all good really. Plus, the thing that gets me through is the thought that this is definitely the last time, mostly because I cannot fathom how I would manage another pregnancy like this with two children. Definitely the last one. On Friday, my little daughter turns three, which is the weirdest thing. I'm not feeling too emotional about it this time round (last year, when everyone had gone home and Chris put Jellybean to bed and I swept up all the cake crumbs/wrapping paper/birthday debris, I had a 'my child is growing up too fast' cry. Just a little one). Amongst my childcare friends, the general consensus is that three is the hardest age. The hormones, the tiredness, the attitude. But I'm excited about it (even if I'm exhausted in advance). She's a proper little person now. Like a tiny, funny, slightly temperamental friend. I am incredibly proud of her. I'm looking forward to getting into a routine from next week. Jellybean starts more hours in childcare, all our groups and activities start up again, and I'm going to start blogging properly. In the meantime we are enjoying that end-of-summer feeling. I'm not ready for autumn yet, but I'm quite enjoying the transition. I like that the light is changing and the nights are drawing in, and that I'm having to sit out here with a blanket this morning, but also enjoying the last few day of warmth and dresses and ice lollies in the garden before it starts to cool down again. Thanks for listening to my waffly post. I'll be back again soon! Sorry to hear about your pain and the virus. Great that baby is healthy and ok. I'm back at school tomorrow (gulp) and the children start Monday. So glad to be getting two days to get sorted though. I'm dreading the 6am wake up and having to eat breakfast so early. I've loved pottering around this summer with both my son's around. I have mixed feelings about transitioning - not the season but the changes. We'd kind of got into a routine with eldest at Uni but moving away? Feeling quite sad watching him pack his life up today. I'm such a softie! Haha, yes ... forgot to mention that! We are all better now so that's good. Also seeing a physiotherapist now, so that's good too.